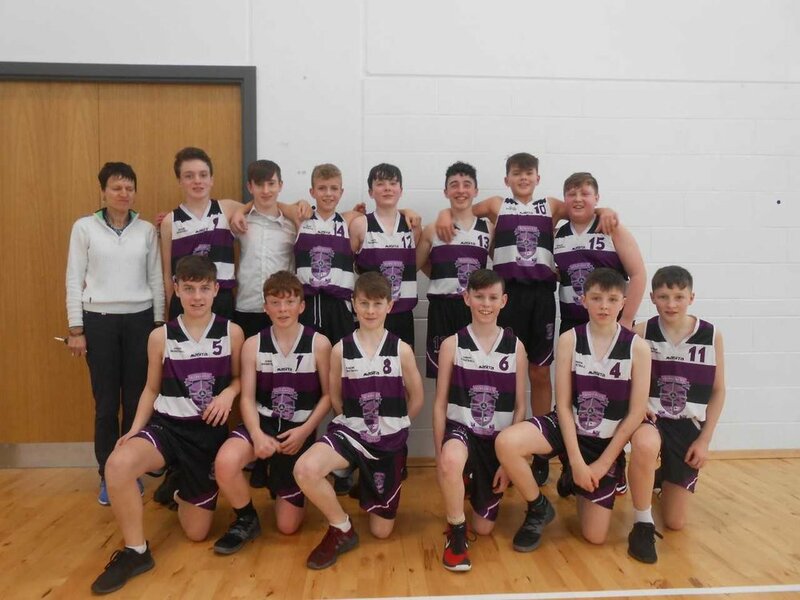 Congratulations to the first year boys basketball team who are through to the county play offs after a battle against Castletownbere on Tuesday. The much anticipated trip to the beautiful Beara Peninsula, shrouded in a thick veil of fog on this occasion has come and gone and our first years have come through a stern test which showed the strengths and frailties in our play. I will begin with the strengths. The dazzling skills of Luca Harte, Dylan Hourihane and Brian O'Driscoll sparkled in our latest nerve tingling battle. Luca is as valuable to our defensive set up as Robbie Minihane to our cadets and he pulls the strings in attack. Brian provided the guile and skill to break through a resolute 221 zone defence and despite carrying an injury, threw himself into the defence. His beautifully taken 3 pointer when the match was on a knife edge sealed the victory for our side and brought his scoring tally to 10 points. However, for overall work rate, sticking to his player like glue, determination and skill, Dylan Hourihane deserves the M.V. P. award on this occasion. Dylan was also our top scorer in this tough encounter scoring 13 of our 35 points. Our supremacy in the first quarter looked like we were going to cruise through the rest of the match but the events of the second quarter show the enormous amount of work ahead for our team should we have ambitions to go forward. While Brian kept the pressure on, Olan Hurley popped in a lovely shot from the top of the zone and Simas scored his two free shots. The gaping holes in our defence were exploited to perfection by our opponents and the Westerners came roaring back. A man to man defence is only effective when everyone defends and having two players standing is nothing short of basketball suicide. We were also gulity of a huge number of missed close shots. The panic that set in during the second quarter continued for the rest of the game and Castletownbere took full advantage of our defensive frailties. The momentum shifted sharply, the huge home crowd transformed into life and the pulse became louder in the hearts of the home team. Earlier this year when our under 16 boys fought back from 18 points down to win by three against the Kerry champions Killorglin, all those from S.C.S felt the waves of exhilarating excitement. This time we were left feeling drained. Castletownbere took the lead, 28 to 26, with three minutes left on the clock. Dylan responded showing determination and resolve. Jack Hawley flung a no hoper at the basket. It went in. The sides are level. CTB Jack fires up another and miraculously that goes in too. For Chris and I , the tension is unbearable and the stadium has become a cauldron packed with animated spectators. Chris leaves the hall. The calm, efficient uniform and first aid expert can't take all this excitement. We are two points down again, the clock is ticking. Time goes quicker when you are behind! In a break away frenzied attack, Olan calmly popped in another. We are level again. Perhaps we can breathe now. Dylan throws himself at the opposition with Thomas O'Mahony - like intensity, strips the ball from his opponent and attacks, scoring another. Our passionate second years are the best supporters in the country. We are two points up and the seconds are draining when Brian pops in the most beautifully taken 3 pointer. He jumps with joy and smiles. The relief is palpable and the spirit of SCS is alive. We survived this battle but going forward to the knock out stages, we will have to address many aspects of our play. Our win today will not define us. Our response will.